A Little Bit of Hair-story, Plus a Few More to Check Out! I have been trying so many new hair products that I find myself having a hard time keeping all of the new products straight. Looking back to see what I have written about thus far and what I have yet to write about, I could not believe how many Hair Care posts I have written -just since the beginning of the year. Kronos Hair Care K-Charge Discovery Kit. EverPure, a Sulfate-free Color Care System. A NEW Hair Care Line from AVEENO. Get Luxe for Less: Hair Products Under $15. Ojon's Tunu Elastik Hair Smoothing Cleanser &Conditioner. The Latest in Spring Hair Trends. 3 Great Ways to Say Goodbye to the Gray's. Ooh La La: TRESemmé 24 Hour Body Collection. I have so much more that I will be talking about in the upcoming weeks, but I need to quickly point out a few more of my favorites that are taking up residence in my shower or in my hair drawer. First, there is this awesome Jonathan Product Finish Control hair spray. First, this is probably the most gentle hair spray by way of ingredients. It is a vegan hair spray, as all of Jonathan's poducts are. This hairspray holds hair in place, while not looking stiff. No helmet heads with this one. And the strong hold is even brush able for when you change it up a bit during the day. This incredibleness is due to the unique formula was is infused with rose and cucumber essential waters, sweet almond, soy and rice proteins, and a cocktail of botanical extracts including white tea, almond, grapefruit, pomegranate, Tahitian gardenia and coconut. This full size will cost you $30, but trust me it is well worth it. To not be spraying all of the typically harmful chemicals that come from hair spray into the air, all you spray is totally natural. The fact that this product is a top rate hair spray is worth another mention to boot. 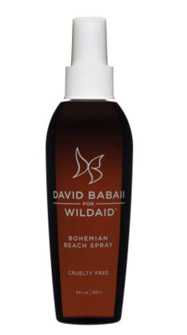 Another newer hair care product that has become a staple is this Bohemian Beach Spray from David Babaii for Wildaid. This is another totally natural product that infuses hair with greatness as it aids in hair styling. You can spray it on wet hair and then style as usual or use it my way of choice, on dry hair. Using it on dry hair gives hair some extra lift while making it look a bit piecey and textured. You know, the tousled look you get from a day at the beach? This spray smells of the beach as well - nice and warm with a scent of coconuts. Again, summer cannot come fast enough for me. The price of this hair styling spray is just $11.95, in which David Babaii donates 10 percent of profits to WildAid, an international non-profit organization engaged in endangered wildlife protection. You can look good and feel good about your purchase at the same time. You can pick Bohemian Beach Spray at HSN.com, Sally's as well as Davids website. You can see how obsessed I have been with hair care and products lately, and like I said, I have many more goodies to try and report on. In the meantime I was wondering if you have found any new hair beauty that I need to check out. Let me know in the comments!